Her Accra community tour concert stop at New Town ended as another deep brand impression and it's a sure bet that Queen Ruki again scooped more new fans into her growing fan base just as she did a few months ago at Lapaz with her stunning performance. Finding herself in a male-dominated game, it's pertinent Ruki plays somehow manly to become highly relevant rubbing shoulders with top male artistes and better still achieve fast eligibility for the top 10 hardworking Ghana reggae-dancehall female artistes listing, thus Ruki's Accra Community Tour series can be considered a smart manly play tactic that will eventually give her her big break into mainstream and wide popularity, backed by a tough managerial push by her One Family Yard management. Nothing fell short the entire time Ruki was on stage serving the New Town audience. Her performance was not just so beautiful but also very impressive by all standards. 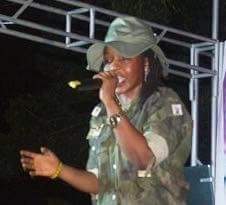 Watching her killing it riddim after riddim wearing that military uniform was awesome. Aside equally nice supporting performances by other artistes, the concert also brought on stage Jah Gold, Daddy Bosco and Jah Wiseman who gave sanitation speeches to conscientize the audience about general cleanliness. The concert was powered by Reggae Network Ghana and Sariki Samaritan, with official backing by One Family Yard, Bakanoo Lakeview Resort and Coconutz & Dreamz.